Are you still looking for the perfect holiday gift to give someone? How about a subscription to FabKids? This is a great monthly subscription service for children's clothing. How does it work? It's really quite simple. Each month you are charged the same amount on your credit card, for an outfit credit .That credit goes into your FabKids account, and you can use it for an entire outfit, any time you feel like picking one out. What if...one month you decide you don't want to be charged for an outfit credit? Simply log into your account and say (by the due date to say it!!) that you don't want to be charged. It's as simple as that... really. If you want to buy above and beyond the one outfit, you are able to do that at will. FabKids runs some really great sales, quite regularly...so getting high quality clothing, that looks great too, really can be done for a reasonable price through their website. the Coated Black Denim Pants. 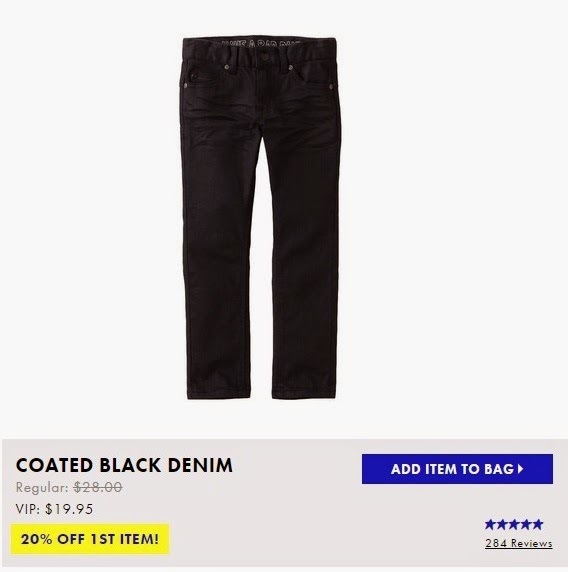 These are skinny jeans, which fit my son just right because he's so thin! They have a nice sheen on them, that is very subtle, but still very cool. They wash well, and my favorite thing about them besides durability (all of our FabKids outfits are so durable!) is the adjustable elastic strips on the inside of the waist band. Like I said, my youngest is very thin, but he's also getting tall, so in order to get pants long enough, we have to buy a size 8. His waist is def. a size smaller. The elastic adjustment straps (undetectable because they are on the inside of the waist band) make them a perfect fit. FabKids are durable, fashionable, and fun! We recently went to the mall. I wish I could say it was to do some holiday shopping...but that's not why we went (I'm always way ahead for holidays...not this year!). While we were there, I couldn't resist getting pictures of little man next to the holiday displays with his festive shirt. You can see the shirt is a nice length for leaving out, or tucking in! The snowman seemed happy that we were taking pictures. See his big smile? 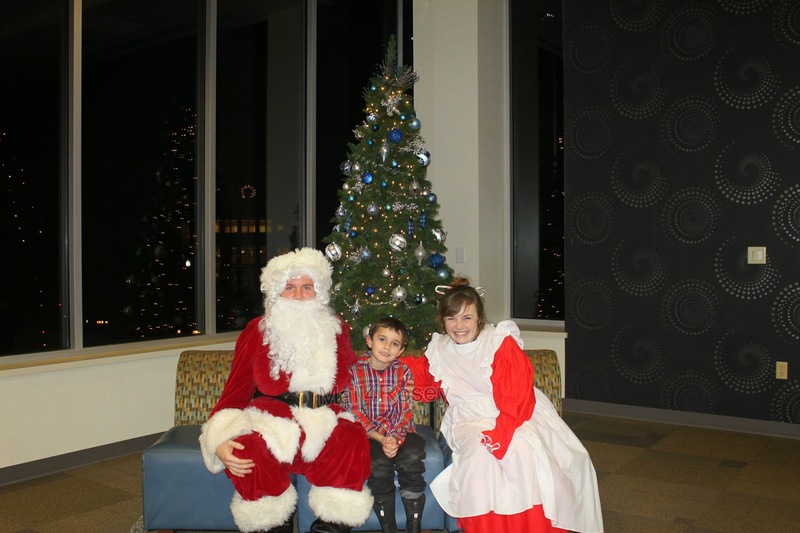 On a different day, my son also wore his new FabKids outfit to go see Santa & The Mrs. I know the monthly subscriptions are all the rage right now...if your'e going to have one, or gift one, why not one that offers children a fun new outfit every month? We love our subscription, and it's always a delight when one shows up on our doorstep. I love FabKids. They have such cute stuff. Your son is adorable! FabKids has such adorable clothes. Love the pictures with Olaf! Sometimes it's really just so much easier shopping online, especially during the holiday season when the malls are so busy! I've heard some great things about Fabkids they have really great clothes. Super cute too! I love picking through FabKids' look books for my 4 year old. I can't wait until the baby is big enough to wear their clothes too! Those clothes are nice. I really like this idea. This is a great idea. Kids always need new clothes. Great gift idea. This really is such a fun gift that keeps giving all year round! I always love his outfits he gets from FabKids! I hate clothes shopping so my kids are forever outgrowing there clothing and I haven't picked anything new up yet....... it's annoying! LOL This would totally fix the problem! FabKids clothes are really cute. I will check them out online. I really need to look into Fab Kids. My daughter would love to get new clothes like this. Very cute stuff you have there. I love fabkid clothes. They have so many cute options. This is such a cool idea! I will for sure have to check fabkid clothes out!!! That shirt is very festive and looks great on the little man. FabKids rocks!! I love this idea! I really need to check them out. With new twins I am sure we will be buying lots and lots of clothes! I never knew a subscription service like this existed! Your son looks so festive in his outfit. He's def ready for the holiday! This is a good way to save for outfits from fabkids. Plus they have nice designs too. He is always so cute! Love these outfits!!! He is just such a good looking young man. He always looks so stylish in his FabKids fashions! He looks really great in that outfit! OMG I love your sons rain boots! so cute! and love his outfit! That's a pretty stylish outfit. The Fab line of products continues to amaze me. I am still not on the FabKids train. I am not sure why because the clothes are so cute, and the prices are reasonable! They always have awesome outfit ideas at Fab Kids. Love this for the holidays. I think this is a great service for kids. They grow so fast. And you can try the newest styles to see if they like them. Very cool! I see you talk about FabKids all the time! I really should give it a try! I adore FabKids. I would love to take my girls shopping there one of these days! It looks like so much fun, and that is an awesome snowman. I keep meaning to check this out for my boys. It's so hard to find them cute clothes. Fabkids has such awesome looking clothes. He looks so adorable in that outfit! I love FabKids! They have awesome pieces! What adorable pictures!! Your kids look so great in their clothes! I haven't heard of FabKids but they sound really good. Thank you for the overview and introduction! Hi Rosey! Long time no see! Your little guy is getting so big and looks adorable in his outfit. Tammmyyyy!!! So happy to see you! Merry Christmas to you!! I definitely need to look into this for my nieces and nephews. He looks super cute in the plaid shirt! This sounds like a great subscription. This is my first time hearing about Fabkids. Definitely a great website indeed! I love the picture with Olaf, too cute! Love the shirt! It does look great in the holiday photos. This FabKids option really sounds like a really nice, different type of subscription to consider as a gift. 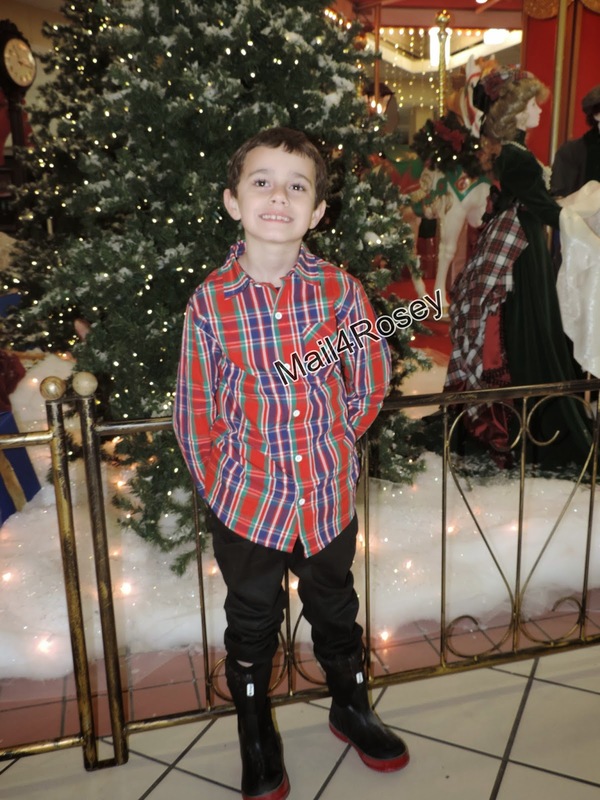 Also, I really love plaid on my nephew - I think it looks really nice for his age group (9 year olds). What a handsome your man indeed. I love the outfits from Fab Kids clothing. Thanks for sharing. Hey! It's Olaf! So adorable! He looks great in that shirt. A fantastic subscription - we don't have many like this in the UK! I'm exactly the same with holiday displays, ha ha ha - my poor boys! Awww he looks so handsome! Looks like fabkids has awesome stuff! My youngest is still too little and my older daughter is too big. I can't wait to try this out though with the youngest. Looks like they really have cute stuff. I'll look into it. That's a great looking outfit. I have hard of FabKids before but never tried them yet. Will have to look into it. The outfit looks good on the little man. How I wish we have that kind of service here, where we can get to review stuff and have shop online. :) BUt mostly they don't allow that. Thank you for sharing this about FabKids. He looks happy and I can tell he's having fun. Great outing with Santa. Are these the same people who own JustFAb? If so that's genius to expand to a children line! These clothes are so cute and look comfortable. I love picking out clothes online so I don't have to go to the mall. FabKids is the best. I love their girls and boys clothing. Your son is so cute! I have never heard of FabKids. Thanks for sharing! It is so hard to fit skinny kids! My son is like that too! He looks great, my son loves his outfits from JustFab. They are so fashionable and cute. 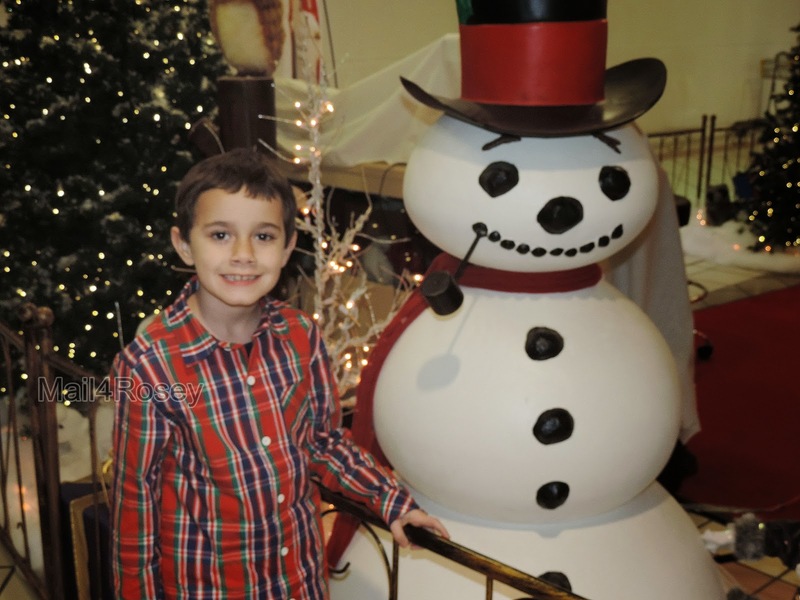 I love the photo of your littlest man with Frosty! How cute. I thought about doing this once. They really do have some Fab clothing. I never knew they existed. Gosh, Olaf is adorable! I've heard some awesome things about fabkids! I'm going to have to check it out for my son! Also, I love Olaf!